If you’re in the mood for a sweet read, Sarah Morgan is always a sure bet. 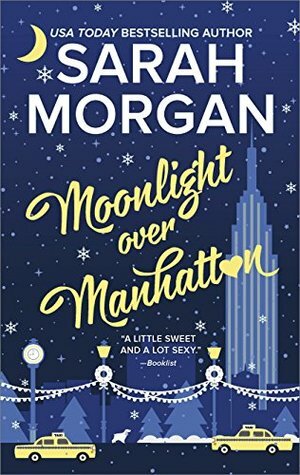 MOONLIGHT OVER MANHATTAN is a delightful and heartwarming addition to this series, with an appropriately festive backdrop that will leave you with fond memories of a woman’s brave quest to challenge herself which leads to the ultimate prize: love. Harriet Knight is shy and prefers to be in the background, especially in view of how she grew up. She has always let her siblings slay her dragons for her while wishing she was as fearless as her twin or assertive as her elder brother. Enter Operation Challenge Harriet, an opportunity for her to leave her comfort zone, which does not start out so well but leads her to ER physician, Ethan Black. Ethan is committed to being successful at every undertaking and he’s doing that at his job. Not so much in his personal life and after a failed marriage he has given up on trying again and prefers temporary liaisons that demand nothing from him. Until Harriet makes him want to try again in spite of his fears. Harriet and Ethan were really enjoyable characters and I loved the slow pace of the story (surprise!) which the author used to draw readers into the world of these characters. The star of this book is obviously Harriet and there is no way to read this book and not have a smile on your face at the end of it. Every page captures her journey from the retiring and bashful character to a confident woman ready to take on the world; like a flower blooming and is an inspiration for anyone looking to make beneficial changes in their lives. The end of this book was my favorite part, especially the cameo by the O’Neils and the chance to catch up on their lives. This is the perfect read for the season: lighthearted and fun; and I recommend investing in the whole series even though this book can be read as a standalone. USA Today bestselling author Sarah Morgan writes hot, happy contemporary romance and her trademark humour and sensuality have gained her fans across the globe. Described as ‘a magician with words’ by RT Book Reviews, she has sold over 14 million copies of her books. She has been nominated four years in succession for the prestigious RITA© Award from the Romance Writers of America and won the award twice; in 2012 for her book ‘Doukakis’s Apprentice’ and 2013 for ‘A Night of No Return’. She also won the RT Reviewers’ Choice Award in 2012 and has made numerous appearances in their ‘Top Pick’ slot.